I've played a lot of Destiny the past couple of years, and I've played through the Destiny 2 campaign and beyond on both PS4 and Xbox One. Counting preview events and betas, I've now played the opening mission of the Destiny 2 campaign at least six times by my count. You'd think that after retreading the same familiar ground yet one more time I'd experience the PC version of Destiny 2 as some sort of rote exercise, but that's not at all how I felt playing Destiny 2 on PC. The visuals, the controls, the feel of the game ... a lot of Destiny 2 simply felt a bit different this time out, and that difference is a good thing indeed. The first things that are unique about Destiny 2 on the PC are that it's not a self-contained game and that it's not available on Steam. Destiny 2 is the first game to appear on Blizzard's Battle.net service that wasn't developed by Blizzard. To play Destiny 2, you'll need to create a Battle.net account with Blizzard, and if you already have one then you're already good to go. Fire up the Battle.net launcher and you'll see Destiny 2 on the game list on the left just like any other Blizzard game, the one difference being that Destiny 2 appears under an Activision games subsection. Like all other Blizzard games, Destiny 2 is installed, patched, and played through the Battle.net launcher, and this also means that your Battle.net friends list is by extension your Destiny 2 friends list as well and that you can send cross-game whisper messages. Nothing has been announced along these lines yet, but the integration into Battle.net also brings up some intriguing possibilities for future further convergence of Destiny 2 into the realm of Blizzard games. Destiny 2's campaign provides a self-contained story that includes enough of an introduction that you can get the gist of what's going on if you've never played Destiny before. Of course, you'll get a lot more out of the story and pick up on all of the references to the first game if you have played Destiny. Destiny 2 in effect pushes the reset button on the Destiny universe, ending the status quo that existed at the end of Destiny by literally blowing the whole thing up. 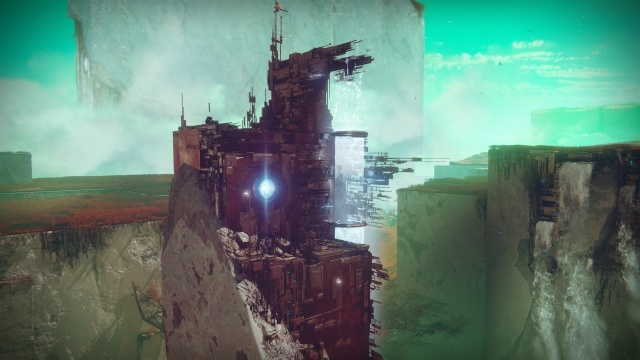 The Last City, a sprawling city on Earth that serves as the last outpost of humanity after a devastating interplanetary war, falls at the opening of Destiny 2 to an assault led by a warlord of the Cabal, one of the enemy races in the game. This assault leads to the near-destruction of The Traveler, the mysterious moon-like entity that originally ushered humanity into an age of interplanetary colonization and continued to protect The Last City. The Guardians, the player characters that serve as humanity's warrior defenders, lose the "light" provided by The Traveler, rendering them both weak and mortal. You play as one of these Guardians, and you must regain your light and fight to bring humanity back together to fight against the invaders. One of the first things you'll notice about Destiny 2 when you play it for the first time is the game visuals. The game is not a straight console port with its graphics hobbled by the limitations of game console hardware. Instead it can take advantage of as much horsepower as you want to throw at it. The game moves along at 60 FPS at its low end, and can reach rates more than double that. The game has a full set of graphics options for you to play with, including an option to lock the framerate or let it run wild. The game will optimize these settings automatically for you based on your hardware and it seems to do a pretty good job at this, but you're free to go in and fiddle with the settings as much as you'd like. I played the game on both a mid-range gaming desktop and a high-end gaming laptop, and the mid-range PC had no trouble delivering visuals that were noticeably more impressive than those of the console versions of Destiny 2. Even though I had already spent a lot of time in Destiny 2, I often paused to take in just how good the game looks on PC. It was like seeing everything for the first time again. Destiny 2 not only looks like a PC game rather than a console port, it plays like one as well. I've played PC versions of console games before, and despite being PC games they simply play better using a gamepad since that's the way they were originally made to be played. Destiny 2 on PC is the opposite, it plays more naturally with a mouse and keyboard than with a gamepad. A good gaming mouse lets you line up your shots with a precision that you just can't match with a gamepad. As much as I liked the precision of using a mouse to aim and fire, I did have a little trouble adjusting to the keyboard layout. Part of this was due to adjusting to once familiar controls being reassigned to different fingers, and part was due to the fact that there are a number of button combos that are now transferred to individual keys instead. Everything can be remapped to your liking, of course, but for me a mouse with a few programmable buttons is a big help here. Destiny 2 is essentially an MMO shooter. The story missions that you'll play during the campaign are limited to solo or co-op play, but outside of these you'll be sharing the worlds of Destiny 2 with other players. The game gives you the freedom to take part in multiplayer events in these worlds or just explore them while battling the local MOBs, but progressing through the story is a requirement for gaining access to your full powerset as well as to open up the end game to you. In addition to the required story missions there are a number of side missions available as well, so there's a good deal of content available to you even if you don't want to push your character to its maximum power level once you finish with the story. You'll also be able to break-up your time spent pushing through the story with different activities available in the game's worlds such as public events, short and challenging objective-based battles, or Lost Sectors, zones to explore that lead to a boss battle and a chest of loot at the end. If you take the time to do a few side missions, partake in these activities, and dabble in some multiplayer matches, you can easily put twenty hours into the game on your way to the story's end. Once you reach that end point, there's still plenty to do in the game. Patrols are short missions that take place in the game's shared spaces and are similar to the minor quests you'll find in any MMORPG - kill this many of that, scout that location, those sorts of things. There are also Strikes to tackle in which a team of up to three players takes on what is essentially an extended story mission with a challenging, multi-stage boss battle at the end. Getting to the boos will involve fighting your way through a number of battles, coupled with some light puzzle-solving and environmental challenges to test your movement skills. There's a bit of strategy required in defeating these bosses, but their greatest strength is their ability to absorb bullets. Each Strike takes place in a unique space and some of the environments are pretty impressive and will have you pausing to enjoy the view. 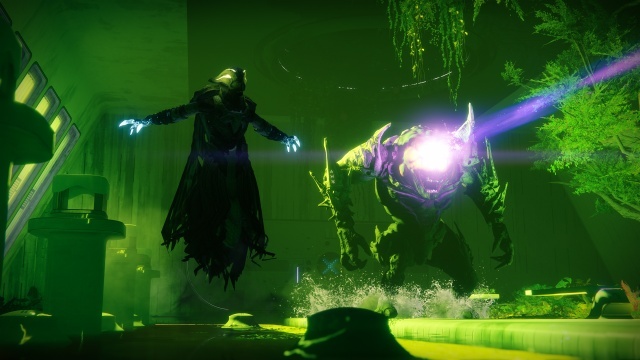 For those looking for an even greater challenge the game provides a Raid and this will require more of a commitment than the Strikes both in terms of teamwork and time, but the rewards for completing the raid are greater. The end game in Destiny 2 is pretty loot-focused - the character level cap is 20, but each character has a power rating as well that is determined from the combination of weapons and armor currently equipped. The Raid, some weekly game events, and rotating challenge missions carry minimum power levels, and while these aren't always enforced as mandatory they may as well be. The game is careful to dole out new gear to you at an incremental rate of level increase, so getting your character to the maximum power level will take some time. Whether or not this will all seem like a grind to you depends on how you approach it. If you focus on your power level and maxing it out, then it will probably feel like a grind to you. You're often lucky to get drops that are a point or two higher than what you currently own. On the other hand, if you just keep playing the game, participating in multilayer Crucible matches, taking on Strikes, participating events, and so on, you'll grow your power to the cap organically as you're enjoying the game. There are three classes available to play in Destiny 2, Hunter, Titan, and Warlock, each of which comes with its own unique set of special abilities and supers. The style of play with each is a little bit different, but these differences are minor in a traditional MMORPG sense. It's not like one is primarily a control class, while the next is a healer; each one is essentially a shootist and you can jump into any Strike or Raid without worrying about the mix of classes in your team. A lot of Destiny players prefer playing as one class or another primarily based on the supers each one utilizes. When you create a new character the game doesn't give you any guidance about any of this, so it's probably a good idea to consult a wiki or other guide outside of the game before committing to one of the classes. The game allows you to create multiple characters, though, so you can always try one of the other classes at any point. 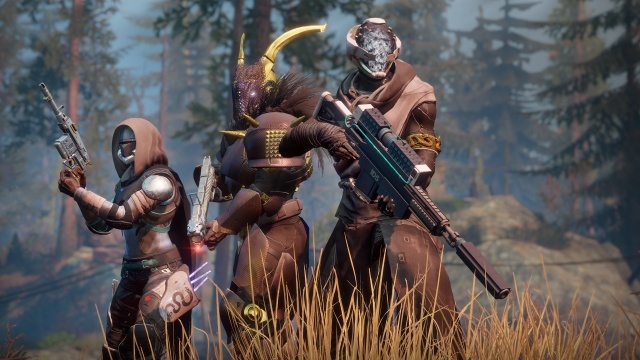 In addition to the campaign missions and zone activities, Destiny 2 includes competitive multiplayer play in its Crucible mode, three-player challenge missions called Strikes, and, a few weeks after launch, a raid. The Crucible game modes are all team-based, 4-on-4 modes in Destiny 2, and include returning modes Clash, Control, and Supremacy along with the new modes Countdown and Survival. Countdown is an attack and defend style mode, with teams alternating between trying to place and detonate a bomb and trying to prevent the other team from doing the same. Dead players can be revived by teammates, but don't respawn otherwise, so eliminating the other team provides for an alternate victory condition. The Survival mode is an elimination match in which each team is given a limited number of respawns. Once they're used up all deaths are final and the team with the last players standing wins the match. Control is a capture and hold mode with three capture points designated on the map. A change has been made to this mode in Destiny 2 in that each team begins with one point in their possession and only the middle point initially up for grabs. Clash is the deathmatch mode, as is Supremacy, except that in the latter mode kills only count towards your team's score if you capture the crests of the downed players. All of the modes and maps in Destiny 2 are designed to keep the action tighter and more focused. Since all modes are four versus four, the maps are optimized to that number of players. I have to admit, tough, that at least initially I'll miss the free-for-all and larger number of player modes from Destiny. Entry to the Crucible is through two portals, once for casual play and one or more competitive matches, although this is a self-policed division because there are no restrictions on which option you choose. Match types are selected at random, which is disappointing because you'll certainly have your favorite among the match types. Strikes are challenging three player co-op missions. Each one tells a story and eventually leads to an intense multi-stage boss fight. I don't want to spoil any of the surprises that are in store for you in the strikes, but I will say that I was impressed with Destiny 2's strikes in comparison to those in Destiny. First, it's obvious a lot of work went into designing the strikes' environments - they're not recycled from other parts of the game or simply throwaway environments. There were times when we took short breaks just to soak in the view around us. There are also environmental hazards to contend with that will test your maneuvering skills in addition to your combat skills. Destiny 2 on PC is the best way to experience the game in terms of its visuals and, for those who prefer to use a mouse and keyboard, in terms of control as well. If you're already playing on a console, I don't think these advantages are enough to recommend migrating to the PC unless you have friends playing on PC that you'd like to join. The journey through the game's campaign will provide you with plenty of gameplay for your money, especially for a shooter, as long as you take advantage of the numerous side missions and activities along the way rather than trying to push your way to the end as quickly as possible. How much more mileage you're able to get out of the game beyond that will depend a lot on you. If focusing on your power level will be your prime motivation for playing, then you'll likely find the game to be a grind. When I play Destiny 2 beyond the final mission, I jump into a Strike, play a few matches of multiplayer in the Crucible, or take part in whatever current game event happens to be going on. The game has kept my interest in that way, but I can see how the daily player who's focused on equipment drops may get a little frustrated by the slow pace and grind of the end game. If you're interested in playing the game, I'd certainly recommend it as you'll get your money's worth out of it, even if you eventually tire of the experience. Final Rating: 87% - Destiny debuts on PC as if it has always been there.